What's new for Spring 2019? What is a representative location? How do I choose an appropriate size for my site? Do I need permission to make observations on public land? How can I best mark my site? How do I identify my plants and animals? Can I start observing a plant if I am unsure which species it is? What can I do if the plant or animal I would like to observe is not on the species list? What exactly is a calibration species? How many individual plants of the same species should I observe? Are there other things I should consider when selecting my plant(s)? What is patch monitoring and how do I set up a "patch"? How can I best mark the plant(s) that I am observing? What if the plant I am observing dies? I requested cloned lilacs but have not received them. What is the status of my request? What type of lilac do I have? Aren't the cloned lilacs you sent me common lilacs? How do I print and use the datasheet packet? How should I answer the various 'Time spent' questions? Why do you care about snow on the ground or in the treetops at my site? How often should I make my observations? At what time of day should I make my observations? What if I never see some of the animals I am observing? Why should I record my observations when nothing seems to be happening? Why should I report on the intensity or abundance of my plant and animal phenophases? What if I missed a phenophase? Why is it valuable to know that a phenophase did not occur at all in a given year? Why should I continue looking for a phenophase even after it has passed? Can I still report 'Breaking leaf/needle buds' (trees and shrubs), 'Emerging needles' (pines), or 'Initial growth' (forbs and grasses) once I see 'Leaves/Needles' or 'Young leaves/needles' on the plant? How do I judge whether or not a leaf is "young"? Why is there a phenophase for ‘Emerging needles’ for pine species but not for other conifer species? When should I report I no longer see 'Leaves/Needles'? How do I judge what percentage of the plant is green in grasses, sedges and rushes? How do I judge what percentage of the canopy is full with leaves or needles? How can I judge the percentage of full leaf size while leaves are still increasing in size? How do I judge what percentage of the canopy is full with colored leaves or needles? Why are there no intensity options provided for ‘Falling leaves/needles’? How are the phenophases ‘Flowers or flower buds’, 'Flower heads' (grasses), or 'Pollen cones' (conifers) different from ‘Open flowers’ or 'Open pollen cones'? How do I judge what percentage of flowers are open on a species with inflorescences? Why do some species have a phenophase for 'Pollen release' and others do not? How is the phenophase ‘Fruits’ different from ‘Ripe fruits’? In counting fruits, should I count all fruits on a single inflorescence as a single unit, as is done for flowers? Can I report seeing both ‘Unripe seed cones’ and ‘Ripe seed cones’ on the same plant at the same time? Why should I look for 'Recent fruit or seed drop' or 'Recent cone or seed drop' (conifers), and how can I tell if mature fruits or seed cones have dropped from my plant since my last visit? When should I stop reporting 'Yes' to seeing phenophases with an unclear endpoint? 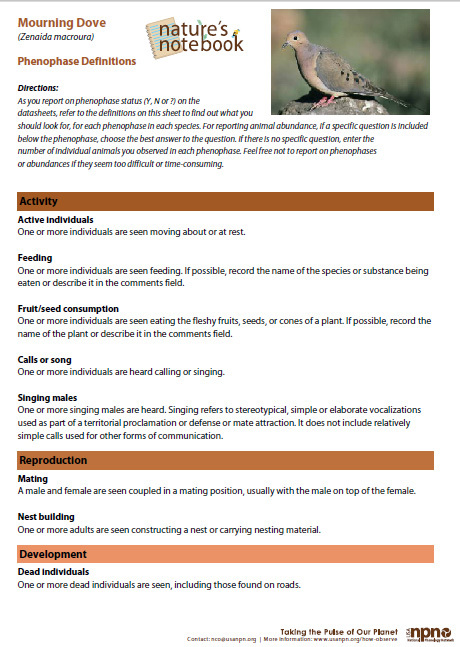 Can I still report seeing ‘Active individuals/adults’ or ‘Individuals/adults on land/water’ if I also report seeing another more specific phenophase? How can I estimate the number of individuals in a large group of animals? How frequently should I enter my observation data? What is the best way to enter the observation data recorded on my datasheets? How do I change observation data once I have entered it? How do I get rid of a plant or animal once I have added it to my site? What is happening when I try to enter data from before this spring? I want to use the mobile app but don’t know how to get started. I’m unsure if my mobile observations were entered. My observations entered while using the offline functionality are not displaying on my computer. I hit/selected the wrong thing when submitting my observation, how do I correct it? We have an Ipad or Tablet at our Nature Center/School/Preserve/Garden; can we enter observations on it? How can I remove my name from datasheets to use with a group? We have added several new plant and animal species to Nature’s Notebook, and updated or added protocols for several insect groups—moths, beetles, aphids, scales, cicadas, true bugs and flies. These insect groups now include phenophases for egg laying, eggs and pupae for species where these stages might be visible to a careful observer. We have also included these phenophases for the monarch butterfly and will add them for our other butterfly species next spring. All the other species and phenophases you are accustomed to are still here, unchanged, and waiting to be observed! We welcome all observations, even if your site is unusual for your area, but we encourage people to select sites that are representative of the local environment when possible. For example, if possible, we recommend that you select a site in a relatively flat or gently sloping area. We also recommend that you avoid areas that are subject to drifting snow or funneled or channeled winds. The site should ideally be neither excessively dry nor wet for your area. In forested areas, the site should be generally similar to the surrounding forest, reflecting the overall canopy composition and stature. If you are observing wild plants, we suggest you avoid locations where plants are watered or fertilized. If your site is unusual for your area, just record the unusual characteristics in the comments section of the Nature's Notebook Add a New Site form when you register your site. The best size for your site depends on the scale of your landscape and the distance over which you can easily see or walk. It also depends on whether you are observing animals or only plants. For plants, a site is the area that surrounds the individual plants you are observing. For animals, a site is the area where you look for the animals on your checklist. If you are observing both plants and animals, your site(s) can serve in both of these ways. If you are observing both plants and animals or only animals: Because you will be reporting observations of animals you see or hear in your site, your site can include the area that you can see and hear well while standing still or the area that you can walk in a relatively short amount of time. If you are observing in an open grassland or near a body of water, your site might be the maximum recommended size (15 acres), because you may be able to identify animals that are far away. In contrast, if your site is in a dense forest, it might be relatively small, as you may not be able to identify species at great distances. Even if you can identify animals over a large area, an area should be divided into different sites if it includes habitats that are obviously different. For instance, if you are making observations at a pond in a meadow, the pond and the meadow should be registered as separate sites. In that case, just report your animal observations for the site at which you saw or heard them, for example, at either the pond or the meadow. If you are observing only plants: For plants, the size of your site does not matter much as long as the conditions are pretty similar throughout your site. If you are observing just one plant, your site can simply be the small area immediately around that plant, say within 3 feet of the plant. If you are observing several plants near one another, you can consider them all to be at one site, as long as the site conditions are pretty similar and the site is no larger than 15 acres or 6 hectares. When selecting the plants to observe at your site, you will want to strike a balance between how much time it will take to walk between plants, while ensuring that the individual plants that you are observing are not too close together (see How many individual plants of the same species should I observe?). Your observing locations should be divided into different sites if their habitats are obviously different. If you are observing a large number of plants or animals: If you are observing more than 20 plants and animals at one site we suggest breaking this up into separate sites in Nature’s Notebook, as sites with many species overload the Enter Observations page. For example, if you have 10 animals and 15 plants that you observe in your back yard, you could break this up into “Back Yard Animals” and “Back Yard Plants”. For people observing more than 20 plants (either as an individual observer or as part of a research project), you can break up large sites into smaller ones based on geographic or environmental features, or sub sites related to your study. For example, you could split up a lake bog site into “Lake bog lowland”, “Lake bog highland” and “Lake highland”. Many public agencies encourage observations of this kind and would be glad to know that you are reporting your observations to Nature’s Notebook. However, you should get permission to make observations from the appropriate department of the federal government, state, or municipality that has responsibility for the property. Land managers often issue written permits for land access, which will help ensure that you can mark your sites and plants and can regularly visit your site. There are many options, but the most important thing is that you mark your site so that you can find it again in the future. For most sites, it is probably easiest to mark the four corners with colorful flagging, scrap cloth, or something similar. You can also use natural or man-made landmarks, like the edge of a yard, big rocks, a bend in a trail, a road, or something similar, to define the boundaries. You will need to replace your markers periodically as they weather and become unreadable. Also, remember that if you are observing a site on public land, you will need to get permission before marking the site. How do I identify my plant and animals? Correct plant and animal identification is important when reporting your observations in Nature’s Notebook. We know it can be tricky to identify a plant or animal, and luckily there are many field guides and online resources that can help. Many communities also have gardening, birding, native plant or naturalist groups, cooperative extension offices, nature centers, local colleges, herbaria, state or national parks, or wildlife refuges where you can find people to help identify plants or animal in your area. If you are uncertain of your plant’s identity, you can certainly record your observations on a datasheet until you have identified it (see Can I start observing a plant if I am unsure which species it is?). If you are uncertain whether an animal you saw was a species on your list that you are observing, it is best to record your observation of that species as uncertain by filling in the question mark (?) on your data sheet. The USA-NPN National Coordinating Office staff is small, so unfortunately, we cannot visit your site or identify your plant or animal from a photograph, but we will continue to add more information to our website to help make identifying plants and animals easier. Look for plant or animal field guides at a local or online book store. Field guides that are particular to your region are often the best choice. Yes, you can keep track of observations on a field datasheet, but please do not enter your observations online until you have identified the species with reasonable confidence. When a plant is dormant, it may be difficult to tell which species it is, but you probably have a good idea about whether it is a forb, grass, deciduous tree, evergreen tree, or another kind of plant. The phenophase definitions within these broad groups are fairly standard, so we recommend you find a similar species and use the datasheet and phenophases for that species (see some choices below). Once you have identified the plant, please check the phenophases for that species to make sure they are consistent with what you had been recording. If they are consistent, you can enter the data online. If they are not consistent, please do not enter your old observations. Instead start fresh now that you have identified your plant. If it turns out your plant is not on the species list, please see What can I do if the plant or animal I would like to observe is not on the species list? 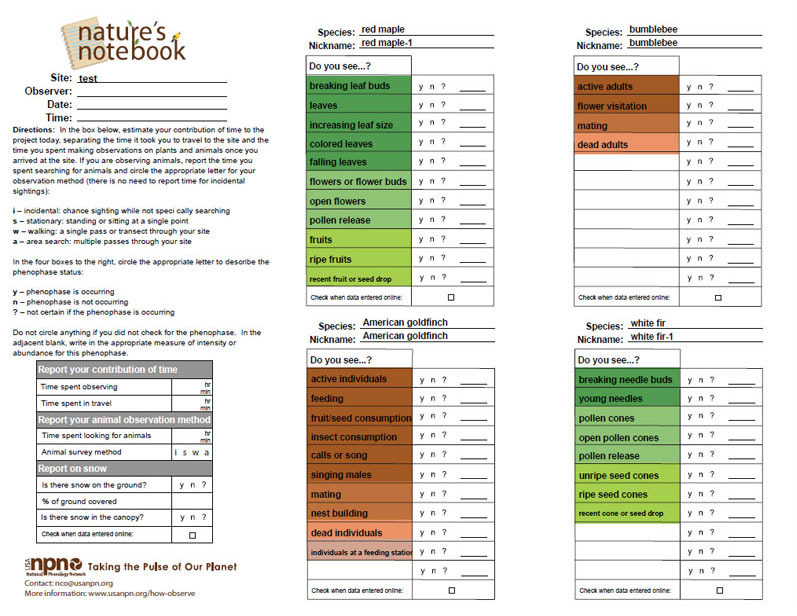 The Nature's Notebook species list includes plants and animals that are important to observe for a variety of reasons, including their ecological and economic importance, conservation value, importance as game species, association with health issues such as allergies, or importance to ecosystem services such as food supply. We are constantly working to revise and expand the list of species and the related materials and welcome your suggestions for additions or other changes. In the meantime, if you would like to start observing a plant or animal not currently on our species list, you can observe that species using a datasheet appropriate for a similar species, and submit your observations to Nature’s Notebook later if we decide to add that species to the list. You may also consider participating in one of the many other observation programs that are tracking the phenology of particular groups of plants and animals (see a list of other observation programs). Please send your comments on our list of plant and animal species to nco@usanpn.org. A Nature’s Notebook plant calibration species is one of 20 plants selected to help "calibrate" phenological measurements across the United States. These species have broad distributions and are ecologically or economically important. Scientists use observations of these species to get "the big picture" of phenology across the nation. We encourage observers to include at least one plant calibration species in their observations. We need many observations of calibration species to understand the changes taking place in the timing of seasonal events across the nation, particularly in relationship to climate change, and to inform decisions that must be made in response to some of these changes. For most observers, we recommend observing between one and three individuals of the same plant species at a site. Observers at research sites may wish to choose three to five individuals per site. Observing multiple individuals helps to give scientists an idea of the variation in phenology among individuals at your site. In some years and for some phenophases, multiple individuals will exhibit identical timing in their phenology, and in other years or phenophases they will not. Even if your multiple individuals seem to always exhibit the same timing, that is still interesting to know and valuable data to collect! When you choose the number of individuals to observe, you should consider the time it will take to make the observations. If you do decide to observe multiple individuals of the same species, try to select plants growing in a similar environment (for example, have similar amounts of sun or shade), but which are not direct neighbors—selected plants should not be closer than two or three times the width of one of the plants. For example, an observer might select three lilacs growing in his or her yard, each growing in full sun and spaced three plant widths apart from each other. If the lilacs are growing as a hedge, this would mean every third lilac plant could be selected. If you are observing the same species at multiple sites but have limited time, you may want to observe multiple individuals of each species at one of the sites, and only observe one of each species at the other sites. Yes. Although we welcome all observations, we encourage observers to avoid selecting plants that are closer than 20 feet to a road or building. Also, please read the “Special Considerations for Observing” section of the species profile to find out if there are other considerations for your plant species. For example, some species grow clonally and form large clumps of stems growing from the same roots, such as aspen or staghorn sumac. If your plant can be clonal, try to choose individual stems from different clumps. Where it is not possible to follow these guidelines for a specific individual, mention that in the comments section of your Nature’s Notebook Add or Edit Plants form. For small plants that grow in large masses of individual stems, it can be difficult to single out a few individuals to observe over time. Instead you can set up a patch of a designated size and report on the phenophases for the patch as a whole. This method works well for grasses, clonal species that tend to grow as a groundcover, and very small forbs that tend to grow in clumps of individuals. To set up a patch, mark the four corners of a square within the area the species takes up over the ground. We recommend a square that is three feet (or one meter) on each side, but the square can be smaller (such as one foot on a side) if the species does not cover an area as large as a nine square feet (or a square meter). When you register the plant on your Nature’s Notebook Add or Edit Plants page, simply click the check box for “Patch?” to indicate you are observing a patch rather than a single individual, and report the size of your patch. If the species covers enough area at your site, you could create several patches to observe separately just as you might choose several individual trees of the same species to observe. Evaluate the phenophases in the patch as if all of the stems in the patch are a single individual. If there happens to be more than one species present in the patch that you would like to observe, you will need to register each species as a separate plant in your Nature’s Notebook Add or Edit Plants page. As you evaluate the phenophases in the patch, make sure you are considering each species separately. For trees and shrubs, you can attach flagging tape or small, inconspicuous aluminum tags (which you can buy at a hardware store or forestry supply company) to the trunk or a branch on each plant. For grasses and forbs where you are observing individual stems, you can place labeled toothpicks, popsicle sticks, or skewers in the ground next to each plant, or loosely tie colored string around the base of the plant. For patch monitoring, you can put PVC, metal or wooden stakes at the four corners of the patch and write the name or number of the patch on one of the stakes. However you mark your individual plants or pa, you will want to make sure you do not change the growing conditions of the plant. For example, avoid placing a broad stake next to a small plant that would shade it or cause root damage. You will need to replace your markers periodically as they weather and become unreadable. Also, remember that if you are observing at a site on public land, you will need to get permission before marking the plants. If an individual dies or is obviously declining in health (when others of the same species around it are still healthy), you should select a new individual to observe. However, be sure to mark the old individual as dead on your Nature’s Notebook Add or Edit Plants page and add the replacement as a new plant with a different nickname. If you are observing any annual or biennial species at your site, you will need to select a new plant on a regular basis since the individual plants die after one and two years, respectively. However, if you are observing a patch of an annual or biennial species, you can continue to observe the same patch year after year if new individuals of that species continue to grow in it. I requested a cloned plant but have not received one. What is the status of my request? We are no longer taking requests for cloned lilacs, as they can be easily and relatively inexpensively ordered from Jung Seed Company. You can place your order through their website, or by calling 1-800-247-5864. You may also purchase a common purple lilac (Syringa vulgaris, usually called "old fashioned" or "hedge" lilac) from any nursery and observe it. Common purple lilacs make good "partners" with cloned lilacs, because their phenologies are quite similar. If you received cloned lilacs from us, they are not common lilacs. Rather, they are specially cultivated Chinese lilacs (Syringa x chinensis 'Red Rothomagensis'), which have leaves that are about twice as long as they are wide (much narrower than common purple lilac leaves). These are the same lilacs that were distributed to people who made phenology observations as a part of the historical lilac phenology networks run through the U.S. Department of Agriculture and the University of Wisconsin-Milwaukee. Most lilacs that you might purchase from a nursery or that are growing in yards or in parks are common lilacs (Syringa vulgaris, also called "hedge" or "old-fashioned" lilacs). These plants are NOT clones, and occur in the wild in many areas of the United States, although they are not native here. Common lilacs have leaves that are somewhat "heart" shaped (much wider than cloned lilac leaves). When you click “Create Datasheets" from your Nature’s Notebook Home page, a window will appear prompting you to create all or some of the datasheets in your datasheet packet. Once you make a choice, a pdf file will be downloaded (or you will be prompted to download it) on your computer. You can then print the datasheets to use for recording your observations in the field. To start out with, we recommend you choose “Create All Datasheets” and print the entire packet for your site. 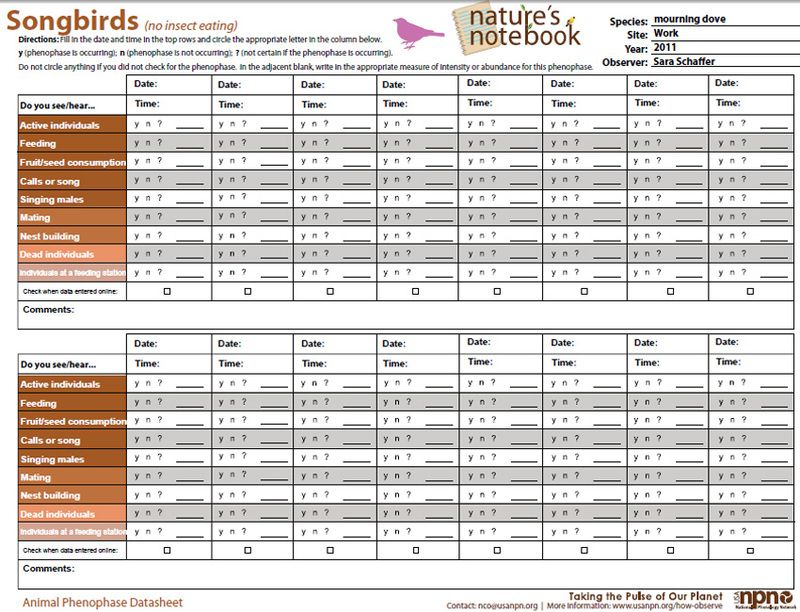 The packet includes a Cover Sheet, an Animal Checklist (if you have added animals to your checklist), an Animal Phenophase Datasheet & Definition Sheet for each species of animal you are observing, and a Plant Phenophase Datasheet & Definition Sheet for each individual plant you are observing. The purpose of the Cover Sheet is to report information to describe each day you visit the site. 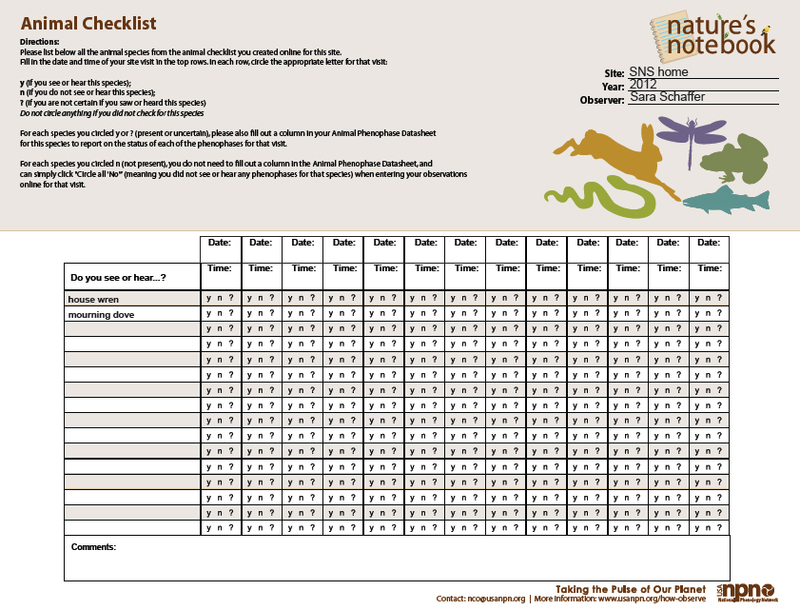 The Animal Checklist (if you are observing animals) provides a quick summary of the animal species seen or heard at your site on each date. The subsequent individual plant and animal Phenophase Datasheets are for tracking your phenophases observations for each animal species or each individual plant. On the Animal Checklist, please list the species of animals you are looking for at the site, and for each day you visit your site, circle "y" (yes) if you saw or heard that species and "n" (no) if you did not see or hear that species. If you were uncertain whether you saw or heard that species, circle "?". On each of the Plant and Animal Phenophase Datasheets, please fill out a column for each visit and indicate whether or not you saw or heard each of the phenophases. For Animal Phenophase Datasheets, you do not need to fill out a column for dates you circled "n" on your Animal Checklist and thus did not see or hear that species. The default option for a “Species by Species” datasheet allows you to have separate pages for each species, with multiple date columns. This type of datasheet can be reused for several observation periods, since each column has a unique date field. There is also an option for a "Day by Day" datasheet that will allow you to have all your plants and animal species contained in one document, with space to record observations for only a single visit. Depending on how long your species list is at a specific site, the document size may be reduced down to a single observations page. See What is the best way to enter the observation data recorded on my datasheets? when you are ready to enter your data online. On your observation Cover Sheet and in the online interface for entering observations you are asked to report 'Time spent observing', 'Time spent in travel' and 'Time spent looking for animals'. We ask you to report these three things for very different reasons. The purpose of the first two are purely administrative, to estimate the volunteer time contributed to the project. These estimates can be important in securing funding to keep the project going. The purpose of the third, 'Time spent looking for animals', is scientific, to estimate the time that went into animal sampling which will affect how many animals you see or hear. This third estimate is very important to scientists using your data. Time spent observing: For each visit, indicate how much time you spent making observations. You should include the total time you spent getting organized, observing animals, and checking your plants. Time spent in travel: For each visit, indicate how much time you spent traveling to your site. This includes any time spent in a vehicle as well as time spent walking or hiking to get to your site. However, do not include travel time that you would be taking anyway, even if you were not making observations. For instance, if you make your observations from your regular work location, do not include the time spent driving to work. Time spent looking for animals: For each visit, indicate how much time you spent actually looking for the animals on your Animal Checklist. You should not include any time in which you were not aware of the animals around you, for instance, while you were busy organizing datasheets or focused solely on checking your plants. Part of the value in your ground observations of phenology, especially leaf phenology, is in helping scientists who study satellite images understand and interpret what these images are showing them. Since sunlight reflected off snow can look the same as bright green leaves in these images, your reports of snow on the ground or in the treetops can eliminate some of the guesswork in interpreting satellite images. By comparing the ground observations you take at your site to a satellite image of the area that includes your site, these scientists can "ground truth" or "validate" the images, and therefore become better at interpreting other images across the globe. You should make observations as often as is convenient for you. Ideally, we would like observers to make observations once a week or even as frequently as every two or three days, particularly during the spring and fall when plant and animal phenology is changing quickly in many parts of the country. Plants and animals can often be active during the winter, but if you live in a cold region where their activity is reduced, you can lengthen the time between observations during this season. Most importantly, you should record all the observations you make—your observations, no matter how often you make them, provide valuable data! You should make observations at a time of day that is convenient for you. Because some animal species tend to be more active at certain times of day and plant activity can vary over the course of the day, it will be helpful if you make your observations consistently around the same time. However, if you are observing both species that are active most during the day (like most plant and animal species on our species list) and those that are most active at dusk or at night (like frogs, bats, and some flowers), you may want to make your observations twice a day, once during the day and once at dusk or night. On most days you will probably not see or hear most of the animals you are observing. You may not see or hear some species all year. Even though it can be frustrating to look for animals that are not there very often, information about when and where a species is and is not is very important to scientists, so please continue to record that you DO NOT see phenophases for these animal species on each day you observe. In some ways the information about when and where a species is not present is more important than information about where it is, because those observations (called negative data) are more rare. This is why we suggest that you observe species from our animal species list that occur in your state, even if you do not see them often, or at all. Having a full record of your observation dates allows scientists to more confidently estimate the date a phenophase began or ended. For example, if you first report that you heard wood frog calls on your April 6 visit, and your last visit (when you did not hear them) was April 2, we know that the wood frogs started calling sometime within those four to five days. If you only report the April 6 visit and no previous visit, we only know that the frogs started to call sometime between April 6 and the last time you reported visiting your site, which might have been 3 months earlier! This example also illustrates why more frequent observations are useful when conditions change rapidly, such as in the spring or fall. If you can make observations every two or three days, you improve scientists’ ability to estimate the day a phenophase actually started or ended. By reporting when a phenophase is and is not occurring, we get a sense of the duration of the phenophase at your site, but we do not know how strongly the phenophase is expressed over that time period. For example, if you report seeing nest building by a bluebird species over a period of three weeks, there is no way for scientists using your data to know whether you saw one pair of bluebirds taking three weeks to build a successful nest, or whether you saw one the first week, ten the second week, and then two the third week. To get an idea of how strongly the phenophase is expressed, and when the peak of activity occurs, we have added the ability for you to report on the intensity or abundance for almost all of the phenophases for your species. For animals, we generally ask the observer to record the number of individuals seen in a given phenophase, and for plants we generally ask for some measure of the intensity of the phenophase on your individual plant, like an estimate of the pecentage of flowers that are open on each observation visit. If you miss the occurrence of a phenophase entirely, and you see evidence that the phenophase did occur, then make a note of this in the comments section of your Nature’s Notebook Enter Observations form. For example, if your plant flowered while you were away on vacation, and you see dried flowers on the ground below the plant, feel free to note this in the comments section of your data entry form. You can note similar occurrences with animals, for example, if you see chicks in a new bird nest, but never saw nest building. Many phenophases do not occur in every year—birds may not breed in a certain area, trees may not flower or fruit, turtles may not lay eggs. Information about when and where these phenophases did and did not occur is very important to scientists studying these species and the interactions between species. Many phenophases may occur two or more times in a year. Many birds lay a second clutch of eggs in the summer after the first clutch has fledged. If a frost or pest kills many of the leaves on a tree, it will often have a second flush of breaking leaf buds and new leaves. In dry climates, some phenophases repeat after multiple rain events. Also, climate change is changing the timing and frequency of life cycle events, which is extremely important to capture! For example, as temperatures warm and growing seasons get longer, many species are reproducing more frequently—some birds are having more broods, some plants flower more often, and insects like butterflies and dragonflies may go through more generations in a single year. Yes, you should judge each leaf bud, needle bud, or shoot separately. As long as some buds or shoots on the plant are still breaking or initiating growth and have not yet produced an unfolded leaf or needle, you are seeing ‘Breaking leaf/needle buds’, 'Emerging needles', or ‘Initial growth’. For plants that have more than one bud or shoot, in most cases you will still be seeing ‘Breaking leaf/needle buds’, 'Emerging needles', or ‘Initial growth' in some buds or shoots for many days after you first begin seeing 'Leaves/Needles' or 'Young leaves/needles' from other buds or shoots. It is also possible to see multiple episodes of leaf/needle bud break or initial growth within a season. This might occur after a period of frost, drought, or after a plant is defoliated by insects. However, once ALL the active leaf/needle buds or shoots on the plant have at least one unfolded leaf/needle, you should be reporting that you no longer see ‘Breaking leaf/needle buds’, 'Emerging needles', or ‘Initial growth'. How do I judge whether or not a leaf or needle is “young”? Young leaves or needles on an evergreen or drought-deciduous plant can be distinguished from older leaves or needles because they are smaller, a lighter shade of green, and/or thinner than mature leaves or needles. As the young leaf matures and approaches the size, color and thickness of older leaves on the plant, it can be difficult to determine when to no longer consider it “young”. This is particularly true for drought-deciduous species where new leaf growth is often initiated by rain events. If water becomes unavailable after growth is initiated, leaf expansion may stop, resulting in many small leaves on the plant. If this is the case, you will need to stop reporting that you see “Young leaves/needles” when it appears that the leaves or needles have stopped changing in size, color and thickness (or report that you are “Uncertain” of whether or not you see “Young leaves/needles”). With experience, it will become easier to determine when a leaf or needle is still growing and young. In most conifers, breaking needle buds reveal new needles unfolding, then lengthening of the stem, and the unfolding of more needles until the stem stops growing for the season. In pines, growth of the stem (or “candle”) occurs first, before the needles appear. Once the stem has grown, the needle bundles begin to emerge and unfold from protective papery sheaths along the newly elongated stem. We have decided that ‘Breaking needle buds’ should be an advanced phenophase for pine species, and thus do not include it in Nature’s Notebook at this time. Instead, observation of pine species begins with the search for emerging needles along the new stem. You should continue to report seeing ‘Leaves/Needles’ as long as fresh green or colored leaves/needles remain on the plant. Do not include dried, dead leaves or dead, brown needles that remain on the plant, such as occurs with some species throughout the dormant season (e.g. winter or dry season). In some cases, green leaves will remain on the plant in a frozen condition for part or all of the winter. If more than about 5% of the leaves have remained on the plant in this condition, you should continue to report seeing ‘Leaves’ until they fall off or appear wilted. For grass, sedge and rush species where new growth is from new stems, the plant will probably be 100% green until it begins to turn brown in the late summer or fall. For species where existing stems can turn brown and then re-green, the percentage may start low at the beginning of the growing season, become higher in the middle of the growing season, and then decline again as the plant turns brown again. In dryland environments where conditions are extreme, it can be particularly difficult to judge what portion of a grass plant is truly dead and what portion has the potential to re-green. If this is the case for your plant, you may want to ignore this intensity question and just report on whether or not you see green leaves. To be able to do this requires knowing what a full canopy looks like for any given deciduous or semi-deciduous species. We plan to eventually provide photos for each species to help illustrate this, but in the meantime you will need to make note of the fullness of the canopy once the leaves or needles have grown to full size, but before they begin to fall off towards the end of the growing season. This will be what the canopy looks like at 100%. During your first year of observing, you may want to avoid estimating canopy fullness until you know what it looks like at 100% fullness. Once you know what the canopy looks like at 100% fullness, you should estimate the changing percentage of fullness as the leaves grow larger at the beginning of the growing season (starting at 0% with bare branches before any leaves appear and increasing to 100% when the leaves become full size), and as leaves fall off and the canopy thins at the end of the growing season (starting at 100% and decreasing to 0% once all the leaves have fallen off). One trick is to estimate the percentage of sky seen through the tree canopy. If no sky is visible at 100%, then when you see half sky and half leaves within the area of the canopy, it is 50% full. A similar trick can be used for smaller plants by estimating the amount of ground you see through the canopy while looking down on a plant. We are aware that estimates of canopy fullness by the human eye is a somewhat subjective measure, but combined with more precise measurements made from camera images, it can provide very useful information about the duration of the year over which a plant is photosynthesizing, which in turn affects the amount of CO2 in the atmosphere. For semi-deciduous species, the canopy fullness will not necessarily drop to 0% every year, and may not even get up to 100% every year if the environmental conditions have been extreme (for example, an extreme drought that delays leaf bud break). For these species, the extent of the canopy in a good year should be considered 100% fullness, and 0% would be the plant with all leaves dropped off. If your plant has a dead section that never grows leaves, you can ignore that portion of the plant in estimating canopy fullness so that the plant canopy is 100% full when the live portions of the plant are fully leafed out. This is a little difficult the first year you try it, but gets easier with practice. If you are in doubt, you can use a ruler to measure full size (length and/or width) of a typical leaf during summer of the first year, and then use that measure to better judge the percentage of full leaf size during the period of leaf growth in subsequent years. We are asking observers to note when leaves are less than 25%, 25-49%, 50-74%, 75-94% or 95% or more of full leaf size in order to create an estimate of the time it takes for leaves to grow to full size. Including this measure allows scientists to keep track of the length of the "green-up" period which is an important aspect of a plant's response to climate change. To answer this question, use the principle explained in How do I judge what percentage of the canopy is full with leaves or needles?, but consider only the colored portions of leaves and needles that are left on the plant and do not include the green portions. For instance, if the plant canopy is 100% full with leaves but about half of them are green and half are colored, you would report that 100% of the canopy is full with leaves, and 50% of the canopy is full with colored leaves. If it is windy the next day, and half of the colored leaves fall off (but none of the green leaves fall off), you would now report that 75% of the canopy is full with leaves and 25% of the canopy is full with colored leaves. As the days go on, more of the leaves change color and some fall off, and you might eventually find that only half of the leaves remain on the plant and there is no green left in them. At this point you would report that 50% of the canopy is full with leaves and 50% of the canopy is full with colored leaves. Note that the percentage of the canopy full with leaves or needles (green plus colored) should steadily decline from 100% to 0% as leaves or needles fall off. However, the percentage of the canopy full with colored leaves or needles may go up and down during this time of leaf/needle fall. There are no intensity options for this phenophase because the percentage of leaves or needles that have fallen from your deciduous plant can be calculated from the percentage of leaves or needles that remain on the plant. This is already captured in the value you reported for "What percentage of the canopy is full with leaves/needles?" for the 'Leaves/needles' phenophase. See How do I judge what percentage of the canopy is full with leaves or needles? for more information. How are the phenophases ‘Flowers or flower buds’, 'Flower heads' (grasses), or 'Pollen cones' (conifers) different from ‘Open flowers’ or 'Open pollen cones’? The ‘Flowers or flower buds’, ‘Flower heads’ (grasses), and ‘Pollen cones’ (conifers) phenophases give you the opportunity to report developing flowers, flower heads, or pollen cones before you see any of the flowers or pollen cones open on your plant (flowers are not considered "open" until reproductive parts are visible). Report “Yes” for this phenophase when you see any developing flower or flower bud, fresh (unwithered) flowers, or pollen cones on your plant, whether they are open or closed (however do not include dormant flower buds enclosed in bud scales until that bud begins to break, as occurs in many northern tree and shrub species, such as forsythia). This means that whenever you report you see ‘Open flowers’ or ‘Open pollen cones’, you should also be reporting that you see ‘Flowers or flower buds’, 'Flower heads' or ‘Pollen cones’. For some species, flowers or pollen cones can open on sunny days and stay closed on cloudy days, in which case you should continue to report you see ‘Flowers or flower buds’, 'Flower heads' or ‘Pollen cones’ even when you are reporting that you do not see ‘Open flowers’ or ‘Open pollen cones’. However, once all flowers or pollen cones on the plant have withered, do not report this phenophase even if the dried or withered petals or cones remain on the plant. Note that any given flowering plant species will either have single flowers that sit directly on a woody twig or at the end of a short or long stalk, or it will have many flowers on a single stalk (a flower head, flower spike, catkin or inflorescence). Report “Yes” for ‘Flowers or flower buds’ as soon as you see something that is recognizable as a flower structure, whether it is a developing flower in the process of emerging from a twig on a tree, or a developing flower stalk emerging from the base of a wildflower. For species where tiny individual flowers are clustered in inflorescences (flower heads, spikes or catkins), it may seem difficult to estimate the percentage of these individual flowers that are open over the entire plant. However, oftentimes the percentage of individual flowers open on a single inflorescence will be the same for all inflorescences on the plant. If this is the case, you can choose a single inflorescence, estimate the percentage of open flowers on it, and use that value to represent the entire plant. For larger plants, it is generally a good idea to check a few inflorescences (for example, one towards the bottom of the plant, one in the middle and one towards the top), and average the percentage of open flowers on each of these inflorescences to represent the entire plant. The ‘Fruits’ phenophase gives you the opportunity to report the presence of developing fruits before you see any of them mature or ripen on your plant. Report “Yes” for this phenophase as long as you see fruits on your plant at any stage of maturity, whether unripe and in the process of developing, or mature and ripe. This means that whenever you report you see ‘Ripe fruits’, you should also be reporting that you see ‘Fruits’. Often some fruits will ripen and be eaten or drop from the plant, while unripe fruits still remain, so you may see fruits for a long period of time with ripe fruits present on the plant during some observation days and no ripe fruits present on other observation days. Sometimes it is hard to tell when fruits first appear. Technically they are present as soon as the flower’s ovary is fertilized, but often the ovary does not swell into something resembling a fruit for several weeks. Do not worry about missing this early stage and simply report fruits when you see the fruit as it begins to enlarge. However, once all of the fruits drop all of their seeds, do not report this phenophase even if the pods, capsules, or husks of the fruits remain (or “persist”) on the plant. No, you should count individual fruits. Often not all flowers in an inflorescence will be fertilized and develop into fruit or substantial fruit abortion will occur within an inflorescence after the flowers have been fertilized. For this reason the number of fruits in an inflorescence can be highly variable. However, for some species an inflorescence will result in hundreds of tiny fruits (for example, sunflowers) and you may need to estimate the number of fruits on a plant by trying to roughly count them on a single inflorescence and multiplying by the total number of inflorescences on the plant. Fruit structures in the plant world are very diverse and it can be difficult to identify fruits and determine ripeness. For this reason we have added a species-specific description to the fruit phenophase definitions for each species to ensure all observers are evaluating the same thing. In some cases what is described as a fruit in these definitions does not fit the botanical definition of “fruit”, but you should follow the guidelines in the definition for the purposes of counting to insure consistency across all observers. Yes, absolutely. There are many times when you will see both unripe and ripe seed cones on the same plant at the same time. In some species, seed cones take more than a full year to mature and you could be seeing ripe seed cones from a previous year’s crop at the same time you see unripe seed cones from this year’s crop. Or you may even see unripe cones from the previous AND current year’s crop at the same time. Just be careful not to count as “ripe” any empty cones that have already dropped all of their seeds but remain on the plant. This occurs quite frequently for some conifer species, but these empty seed cones should be ignored. Sometimes a fruit or seed cone is not ripe very long before it drops from the plant. This phenophase allows you to report that one or more fruits or seed cones ripened and dropped from the plant since your last visit. Evidence of ‘Recent fruit or seed drop’ or ‘Recent cone or seed drop’ may include mature fruits or seed cones on the ground below the plant that were not there on your last visit, or fruits or seed cones missing from the plant which were present on your last visit. For this phenophase, do not include the dropping of fruits or seed cones that are clearly immature and unripe, as often happens in a heavy rain or wind storm. You should also not include fruit pods, capsules, husks, or empty seed cones that long ago dropped all of their seeds and are only now falling from the plant. When should I stop reporting ‘Yes’ to seeing phenophases with an unclear endpoint? For common lilac, cloned lilac and cloned honeysuckle, the phenophase definitions have carried over from an historical monitoring project. Two of the phenophases, ‘All leaf buds broken’ and ‘End of flowering’, have no distinct endpoint when it would be logical to report you do not see the phenophase occurring. For these two phenophases, you can stop reporting observations after you have made your first report of seeing that the phenophase did occur. After this point, do not report ”No” you do not see the phenophase occurring, but rather leave all the choices uncircled as though you were not checking for the phenophase. These Primers have been developed to take a closer look at the phenophases and the protocols. They are downloadable resources designed to take a deeper dive into the phenophase definitions. Download both of them from the USA-NPN Our Reports Page. Yes, you should report “Yes” for ALL the phenophases you see occurring on a given date. For animals, if you see a specific activity, like nest building, you are also seeing one or more active individuals, and should be reporting “Yes” to both of those phenophases for that species. If you can see the whole group at once (such as a far away flock, or a relatively stationary herd of animals), try counting a small section of the total group (anywhere from 10 to 50 individuals). Then estimate the space those individuals take up. For example, 30 robins in a far away flock take up an area the size of my fist when I hold it in front of my face. I will then see how many of these fist-sized areas (or blocks) it takes to visually cover the whole flock. Let's say there are 22 blocks. My estimate is then 30 individuals per block, multiplied by 22 blocks, for a total of 660 individuals. You might also consider taking a picture of the group of animals, and estimating or counting the number of individuals later. If you are watching a large group of animals pass by (such as a herd of elk, a school of fish, or a swarm of insects), you will not be able to use the spatial method above to estimate the total number. Instead you will need to calculate a rate and the time is takes the group to pass. To do this, select a landmark, like a fencepost or a rock in a stream, and count how many animals pass by the landmark in a given amount of time. Then time how long it takes for the whole group to pass completely. For example, if I am watching a monarch migration and I see 30 individuals pass by a fencepost in one minute, and the butterflies continue passing for 11 minutes, then my estimate would be 330 individuals. You can enter your data immediately after each observation visit, or you can wait to enter several visits at once. However, the sooner you enter your data the sooner it is available for you and for others to see in our phenology visualization tool! For each visit, input the date and time at the top of a column in your Nature’s Notebook Enter Observations page. Enter the information you recorded on your Cover Sheet for the visit, then enter your observations for each of your plants and animal species. For plants, simply enter the information written on each Plant Phenophase Datasheet. For animals, refer to your Animal Checklist datasheet. For the visits where 'n' is circled for a species, click 'Circle all no' at the top of the column for that visit and all phenophases will be set to "n". If there was a particular phenophase for which you did not bother to look or listen (for instance, you were ignoring bird calls at your site because you do not know how to recognize them), please click the circled 'n' for that phenophase so it becomes uncircled and no selection is made for the phenophase. For the visits where 'y' or '?' is circled for a species, refer to the Animal Phenophase Datasheet for that species and enter the information recorded there for each phenophase for that visit. If you wish to correct your observation data for a particular visit, navigate to that column using the arrows at the top or bottom of your Nature’s Notebook Enter Observations page. Then change the 'y', 'n', and '?' responses to the correct ones for that visit. If you entered the wrong date or time and need to change it, click 'Delete' at the top of each species' column for that visit to remove those records. Then create a new column with the correct date and time and reenter your observation data. If you wish to deselect a circled 'y', 'n', or '?' to leave all choices uncircled for a phenophase (meaning you did not check for that phenophase on that visit), you will need to delete that visit's column for the species and reenter the data. If you are no longer observing a plant or animal, or if you added it accidentally, you can prevent it from appearing in your Nature's Notebook pages. For plants, go to the Add or Edit Plants page and select the plant in the "Your plants" window of the left. You should see the plant's information appear in the window on the right. Click the box next to "Delete?" and a popup window will appear, asking why you want to delete the plant. Make the appropriate choice and click "Delete". If you are no longer observing the plant, all the observation data you entered for the plant will be preserved in the database, but it will no longer appear in your Nature's Notebook pages. If you added the plant accidentally or as a test, the plant and all of its data will be deleted from the database. If you misidentified the plant species, you will be prompted to contact us for more information. If the plant died, you will be prompted to record it as dead before indicating you are no longer observing it. 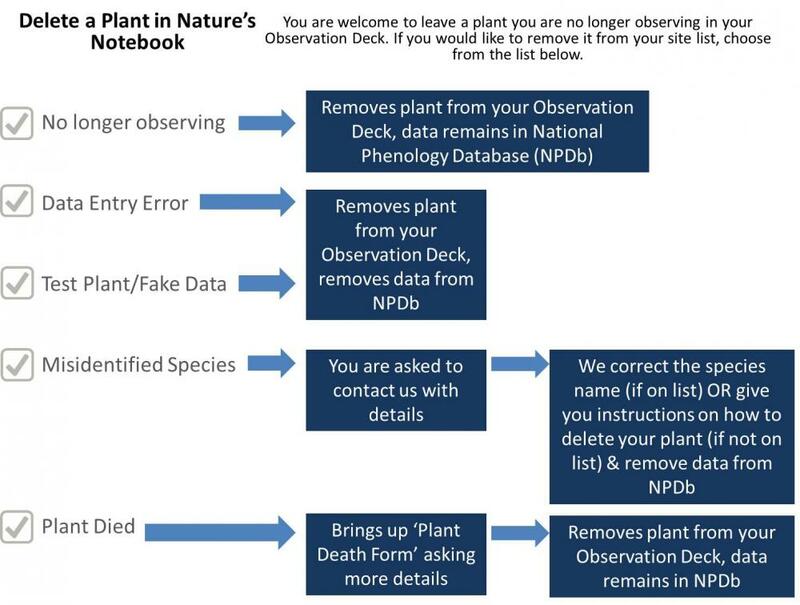 All observation data for a plant that died will be preserved. For more information, click on the Delete plant flowchart icon above. For animals, go to the Animal Checklist page and simply remove the animal species from your checklist. All observation data you entered for the animal species will be preserved in the database. If you entered fake or incorrect data for an animal species, please delete those records before removing the animal from your checklist. See How do I change observation data once I have entered it? for more information. In updating Nature's Notebook each year, we have added new phenophases and revised existing phenophase titles and definitions for many species. However, we want you to be able to go back and accurately add or edit your observations no matter what set of phenophases were used when you collected your data in the past. The following individual(s) are associated with a different set of phenophases for the date you selected: red maple-1. We'll have to reset the page to continue; you'll lose any data on this page that you have not yet saved. Press 'Yes' to proceed. This message lets you know that you are going to move back to a point in time when your red maple had a different set of phenophases (or at least different phenophase definitions) associated with it. If you do want to go back to this point in time, proceed by clicking yes and enter your "red maple-1" data with the appropriate set of phenophases. If you don’t see the complete message as above (this may happen if you have a lot of plants or animals registered), try resizing the pop up box. In order to proceed, click the orange arrow. If you haven’t already done so, we suggest using a desktop or laptop computer to setup your Nature’s Notebook account. Then, using your mobile device or tablet, download the application via the Apple Itunes store or Google Play Store respective to your device brand. Once finished, open the file app and follow the install prompts, when directed to the authorization OAuth page screen, you should click "Grant Access". Granting access allows the Nature’s Notebook phone app to access your Nature’s Notebook account. Using your same login credentials as the desktop site, proceed to login and you can access your account. Initial loading and syncing may take a few minutes, longer if you have many sites, groups or species. Once the app loads your account, you will be able to select the network (or partner group) you’re associated with, existing sites associated with your account, add new personal sites, add plant and animal species to your sites, and enter observations. Individual plants or animals you are observing can be chosen from the dropdown list at the top. The date and time is automatically filled in for you. If needed, you can modify the date and time by clicking in the box and manually selecting. Select your phenophase observation and automatically an intensity question pops up–none of the questions are compulsory; you only have to complete the phenophases you’re comfortable observing. Only answer if you are knowledgeable on the species and individual and if you feel comfortable with responding. When completed with all observations for the individual, click “submit observations” at the bottom of the page and you will be taken to the next individual. The “Enter Observation Details Data” button is for entering information corresponding to the coversheet, regarding time spent and environmental conditions. You will be advanced through your species list at the chosen site till you have responded to all phenophases for each, or you can manually chose the species you wish to observe by selecting them from the drop-down list. The app will continue to be associated with your account for as long as it’s installed. You will remain logged in as long as the app is installed. The mobile application and your desktop version of entering observations are both tied to your same Nature’s Notebook account, so you can see observations from the desktop version that were submitted via the app. On the desktop version, from the enter observation page, use the blue arrows at the top to scroll back and review your entered observations. This will confirm your observations were submitted successfully if there had been any confusion. The Nature's Notebook app allows you to enter data from the field with no data service. Observations are temporarily stored locally on your mobile device. When you return to service area or a Wi-Fi connected hotspot, the app uploads your observations to the database. Android app: You may need to manually sync your mobile device account before it appears in your account. If you’re not seeing your offline observations, while on a good data connection or Wi-Fi and with the Nature's Notebook app open and running, perform a manual sync by opening your Nature’s Notebook app and leave it open, at which point it should sync automatically and behind-the-scenes. iPhone app: You must open the app and there is a button for manual sync. Logged into your account from a desktop or laptop computer, you can go to your observation deck, select your site, and click the “Enter Observations” link. On the Enter Observations page, use the blue arrows at the top of the screen to scroll back to the date of the incorrect submission. Find the error, correct it, and click “submit observations” at the bottom of the page. Edits are also encouraged to be done through the desktop version to ensure observations have been properly and successfully submitted. If you plan to have your personnel, docents, volunteers, or students use iPads for observations, please note that an account login is required when the app is first installed, and that account remains associated with the device. If individuals each have their own personal iPads or tablets this will not be an issue. Users with individual accounts sharing a mobile device will need to install app, grant OAuth access, login as user 1 (as described above), enter and submit observations, then remove the Nature’s Notebook app. Then user 2, on the same mobile device, must return to Itunes or Google Play Store, download and install the Nature’s Notebook app, grant OAuth permissions, and use their own login. This can be repeated as many times as necessary for all users to submit their data. The last user to successfully submit observations will remain logged in. How can I use the same mobile device (such as a smartphone or tablet) with multiple users accounts? If you are using the same mobile device at your group site with many users, you will have to delete the Nature's Notebook application and re-install between users. We are currently working to develop features within the mobile application which allows users to switch accounts to be released in the future. Open the datasheet (PDF) that you’ve downloaded from your Observation Deck with Adobe Professional (this functionality is not available in Adobe Reader). From the toolbar, under “Tools” , select “Show Advanced Editing Toolbar” and select the “TouchUp Object” tool . Then drag your cursor over the Observer field, highlight your name and click delete. Repeat this action for each page of the datasheet packet. This tool will delete any object within the file, so you can also delete your site name and species nickname. Thank you for participating in Nature's Notebook! Across the country, newly germinating sprouts are emerging from the soil, fresh leafy sprouts are emerging out of snow patches, and new green growth is initiating on previously dormant and resting plants. It’s time to record observations for "Initial growth"!